Can a Car Insurance Company Force Me to Exclude a Driver? Car insurance can get pretty complicated. For example, exactly who is covered by your policy? That seems simple enough. You have heard the phrase, "insurance follows the car, not the individual," so that means your coverage applies to anyone driving your car, right? There are certain other drivers who need to be specifically listed on your policy in order for full coverage to apply when they’re driving your vehicle. Who those people are, depends both on your specific insurer and the state in which you live, but it’s typically people who live with you and are licensed drivers. In addition, there are drivers that should be specifically excluded from your policy. In most cases, excluded drivers are ones that you voluntarily wish to have excluded from coverage, because having them not listed would raise your rates. However, there are times when it's the insurer who wants the exclusion, which leads to this question: Can a car insurance company force an insured person to exclude a driver from coverage? What exactly is an "excluded driver?" As touched on above, your auto insurance policy, generally speaking, follows the car and therefore extends to anyone using your vehicle with your permission. In determining premium costs, however, insurers want to know who will likely be driving your car on a relatively regular basis. That includes you (the named insured), your spouse, and any other relatives with driver's licenses living under your roof. So, what happens when one of those relatives is a particularly bad driver with lots of moving violations, DUI's, accidents or claims? If you don’t list them as an excluded driver, you’re likely to see a big spike in your premiums. 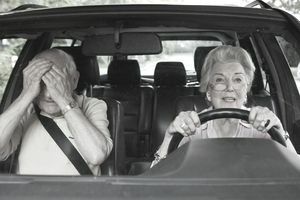 In a less extreme example, often someone in your household might be insured under someone else’s coverage or is a very young or old (or as insurers think of them, risky) licensed driver who lives with you but will not be driving your car. In both cases, you have two options: Pay higher (sometimes much higher) premiums or have the statistically risky driver excluded from your policy. When you exclude a particular driver from your insurance, you are explicitly promising the insurer that the excluded driver does not have permission and will not under any circumstances be allowed to operate the insured vehicle. And as a result, you should not be charged the higher premium rate that you would otherwise have to pay if the driver were not excluded from the policy. Can I really be forced to exclude a driver from my policy? The answer depends on how you define "forced." Insurers can't force you by "making an offer you can't refuse," like in the famous movie. They can, however, make you feel like you are being forced into an exclusion by either charging you an unrealistically high premium rate or threatening to cancel your policy if you do not agree to the exclusion. The company's reasoning is simple. Bad drivers are risky to insure, meaning that they are much more likely to cost an insurer more than you pay in premiums in claim payouts. That, in turn, makes you, as the policyholder, a riskier proposition for them to cover. So it's simply better for them just to cancel your policy than to take on the extra riskier driver. As they also say in that same famous movie, "It's not personal. It's just business." What can I do if my insurance company insists on an exclusion? Although you must have insurance to drive a car on the road, thankfully, no one is forcing you to use your insurer to do so -- and thanks to them, there is no law stating that they must allow everyone in your household onto your insurance policy. Knowing that your insurance premiums are higher due to coverage of a risky driver, you may be happy to exclude them from your policy. Most often though, the person we are talking about is a close relative, maybe a spouse or child -- someone who you want to and may need to allow to drive your vehicle. As a result, if your insurer is insisting on an exclusion from your policy, you are going to have to come up with another solution. The first thing to try is shopping around. Just because your current insurer is demanding an exclusion doesn't mean all the other ones will. In fact, there's a decent chance you will find at least a few willing to insure you without the exclusion. You could also shop around and see if it makes sense for the individual driver to get their own insurance policy tailored to high-risk drivers. If the math makes sense, you could purchase your own insurance policy and list the high-risk driver as an excluded driver, and then you could also have a separate high-risk policy. You're probably going to end up paying a fairly high premium, but if staying with your current insurer means excluding someone that you don't want to exclude, it's likely your only alternative.